In the Transformation Cycle Yoga, the ancient science of unifying body, heart and mind are explored in the context of a PachaMama Transformation Cycle. Following the physical and metaphysical purification of the Body Cleanse and preceding the emotional healing undertaken in the various therapy groups, the yoga workshops strengthen the body, cultivate a connection to oneself and prepare the emotional and spiritual centers for the deep inquiry ahead into one’s true nature. 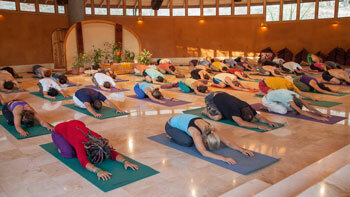 Throughout the year, yoga workshops in the Transformation Cycle are taught by a variety of experienced teachers. The upcoming Transformation Cycle Yoga group will be taught by Vaya. The Iyengar Yoga Intensive is a three-day workshop that explores the family of asanas as they were taught by renowned teacher B.K.S Iyengar. Iyengar Yoga emphasizes precision in the asana, using props, accurate sequences and timings to cultivate respect for the body and eliminate physical injuries. A new quality of the practice is revealed through this unique lens – the quality of “effortless effort”. For many, Iyengar’s language of yoga is a gateway into the ancient art-form. Its creative use of props combined with Vaya’s meditative approach to yoga allows the asana to be embodied fully and deeply, transcending the limitations of physical and mental flexibility. Vaya’s vast knowledge and experience, attention to detail and her soft, light-hearted approach to the practice sets the stage for a deep and meaningful meeting with yoga. The group’s daily schedule is comprised of three classes: pranayama and asana practice in the morning and gentle, restorative yoga practice in the afternoon. The last morning will be spent practicing on the beach, exploring ways to practice outside and integrate yoga more fully into everyday life. Unstructured personal time will be dedicated each day to address questions concerning injuries and special physical conditions, create personalized sequences and turn inward for self-practice. Learn more about yoga in PachaMama. Learn more about the Transformation Cycle. © 2019 PachaMama, San Juanillo, Guanacaste, Costa Rica.